I would like to thank the author for a review copy of this book in return for an honest review. DCI Ryan has been on mandatory leave from his job for three months, but when the body of a girls is found on a remote island, he is finds himself back on job leading the murder investigation. Dr. Anna Taylor, who left the island eight years ago, is called home to help in the investigation, but when her sister also turns up murdered on the same day, the police start to wonder if they have a serial killer on their hands. I didn't expect to like this book as much as I did. I am fairly new to crime fiction, but this book is so well written, that I sound it hard to put down, until I had finished it. I was also shocked to find out that this is LJ Ross' first novel. It is just as good, if not better than some crime fiction I have read by very well known authors. The story is well written and very gripping. It's fast paced and has lots of little twists and turns thrown in that will really keep you guessing. It has a certain air of mystery to it, that keeps you interested and entertained throughout. The characters in this novel are some of the best written I have come across. DCI Ryan is a great character and is very likeable from the word go. The more I read, the more I liked him. I loved how I was kept guessing about his past. Anna, is also a very likeable character and the background information we are given about her, really gives her character legs. I love how much of independent character she is. The relationship between Ryan and Anna, is also beautifully written and the chemistry flows off the page. This book gripped me from the very first page and kept me on the edge of my seat. Brilliantly written and thoroughly entertaining. LJ Ross has found the perfect balance between romance and crime fiction. 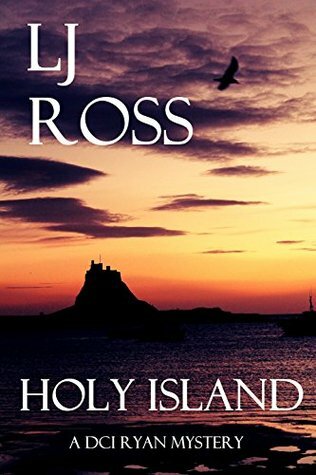 Holy Island is the perfect Crime Fiction book. I was not surprised to see that this is a bestseller, because it is by far the best crime fiction I have read this year! I am so looking forward to sinking my teeth into Sycamore Gap.